most notable in the Masquerade number with over 30 members of the cast. which takes away from the love stories. Andre. The rest of the large cast and ensemble are of top caliber. 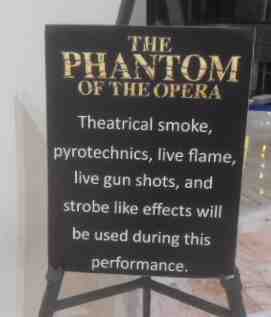 One note: the theatrical smoke and pyrotechnical effects are very heavy and infiltrate the orchestral level of the Center. At one point I was concerned for the musicians and cast because they were so heavy. Running time: Act 1 An hour and 10 minutes Intermission 25 minutes Act 2 An hour.